« Auto bed-leveling for the Makerfarm Prusa i3 – Part 1: Assembly and basic setup. If you saw my earlier review of the Magma hotend, you know I found it a little disappointing. Shortly after publishing that video review, I found out about the 3D Industries AluhotendV4. On the face of it, it seemed to be a nicely balanced compromise between the durablity (indestructibility?) 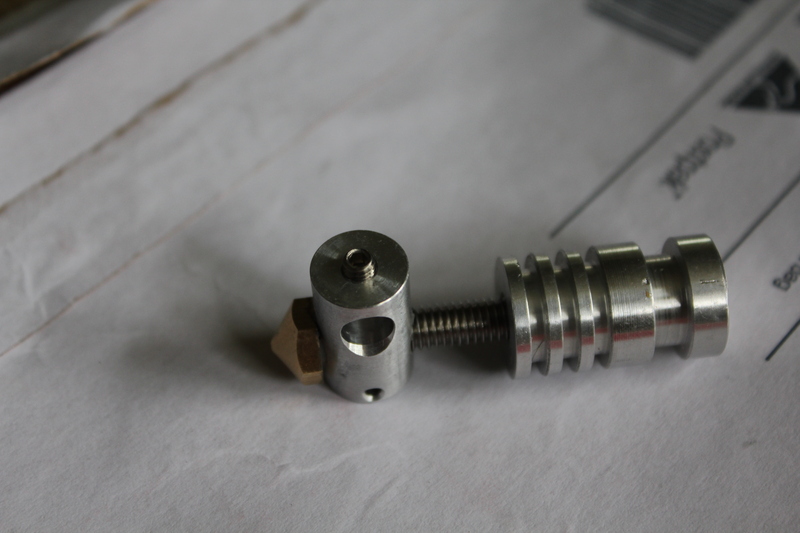 of an all-metal hotend with the usability of the classic J-head. The AluhotendV4, right out of the box! There is certainly a “Family Resemblance” between the Aluhotend and the Magma, and that is not surprising. The Magma is a derivative of an earlier version of the Aluhotend, and retains a number of its design features. The current version of the aluhotend is not an all-metal design, but I would feel very comfortable calling it a “Mostly metal” design. The thermal barrier (the central part of the hotend) is a hollow, threaded M6 tube, lined with a PTFE (Teflon) sleeve. The top is a machined aluminum heat sink, and the business end is comprised of a cylinder of aluminum with holes for a thermistor (more on this in a minute) and a heater cartridge/power resistor. If it’s possible to think a hotend looks cool, this one does. So why am I interested in a “Mostly metal” hotend? Well, in my brief but intense time as a 3D printing enthusiast, I have experienced two major types of hotend failure. The first one was when I looked away from my printer for a second, then looked back and saw that my J-head had melted. The PEEK nozzle holder had melted, causing the nozzle to stick out at an angle that was, at the very least, non-ideal for printing. The second failure I had experienced was with the Magma Hotend. This all-metal design was a disappointment, mainly because it’s thermal properties essentially made printing PLA impossible. On the other hand, the thermal properties of the Magma open up more opportunities as far as printing in some rather exotic materials which require higher extrusion temperatures than the J-head can handle. The reality is, though, the J-head prints ABS just fine, and PLA is widely available in lots of varieties relatively inexpensively. I was not about to give up the ability to print in PLA, which I do almost every day I’m printing, for the opportunity to print in strange, rare, and often highly expensive materials. I will eventually have a dozen or so printers, and when that happens, I’ll try all kinds of stuff. Meantime, I needed another option for my (at the moment) one and only printer. I had the hotend in my hot little hand quickly, but it has been almost a month before I have been able to even see how it builds up. The Aluhotend, you see, does not, like most hotends, come as a kit. It comes as a hotend alone, and it is up to the user to add a heater cartridge (or heating resistor), A thermistor, and if necessary, a mounting plate. This hotend also requires a cooling fan to be blowing over the heat sink at all times, so that will have to be accounted for as well. So it was time to order some stuff: I first got some thermistors, and went with what I knew, the tried and true, reliable B57560G104F, otherwise known as Thermistor #1 (It’s called this because in the Marlin firmware, it’s selectable from a menu as option #1 – also #6, but that’s another story) . Problem is, Thermistor #1 sports a “Large” glass bead, and the AluhotendV4 has only a hole big enough for a size “Small” glass bead. This is actually okay, as Thermistor #1 has been discontinued by the factory, so the supply that’s out there is all there will be. So I went on a brief search and found Thermistor #5 (Semitec 104GT-2), which is readily available. I ordered some of those, and waited some more. I also went looking for 12v 40w ceramic cartridge heaters. Seems you can find them all day for around $5.00US, but rarely with free shipping. I went for a 10 pack for twenty bucks, but had to wait for them to come from Hong Kong. When those finally arrived, I made yet another discovery: The J-heads I had purchased from Makerfarm actually had a custom mounting groove machined into them to fit the 6mm laser-cut plywood mounting plate that came with the printer. So I was off to Hotends.com to get a standard mounting plate. Finally, yesterday, the last parts I needed finally showed up. Naturally, there was a lot going on, and as my vacation days draw inexorably to a close, I realized I would have chance to see how everything fit together, but it might be another week before I would have a chance to really put the new hotend through its paces. Assembly, aside from a couple tiny issues, was ridiculously easy. One of the greatest design improvements of the V4 over the Magma is a grub screw which hold the heater cartridge in place. The Magma has a very precisely spec’ed, but less precisely machined opening for a cartridge heater. Mine was actually somewhat conical, and I had to ream out the opening with a drill bit to get the cartridge in. The Aluhotend, on the other hand, was simplicity itself. Just slide the cartridge in, and give the grub screw about a quarter turn with a 2mm allen key, and you’re done. The thermistor opening actually goes all the way through the block, and the axial thermistor sold by 3D industries makes a lot of sense. I will still be using the traditional Kapton tape method, and attaching both leads on one side. Initially, the heat sink did not fit on the Hotends.com mount, and my calipers told me that the mount was the offending party, so I thinned it with a file until everything fit together snugly (always modify the cheapest part, right?). Without question, this was the easiest hotend assembly I have ever done. Initially, the cost of the Aluhotend seems very low, and it actually is. 3D industries currently sells the hotend for $38.00 Australian, shipped worldwide. At the time of this writing, that’s about $35.00US, which is below the bottom end of the price range for most hotends (The current model J-head, as of a minute ago, sells for $54.99 plus shipping from Hotends.com. That includes a power resistor , a thermistor and teflon sleeving for both.). By the time you factor in the cost of all the little parts, as well as the exchange rate, it’s pretty close to the cost of a J-head. When you consider that the J-head comes with a much less expensive power resistor, and still doesn’t come with a mount, you might be ahead. If, like me, you tend to buy things in bulk, you might even have all this stuff sitting around, in which case there is no question that you have a bargain. Compared to $85.00 or so US for a Magma, and over a hundred for a Prusa, there’s even less to worry about (of course, those are true all-metal designs, so maybe that’s not entirely fair). So far, without actually attaching the AluhotendV4 to my printer, I am impressed. Thank you for so detailed reviews about Makefarm Prusa i3! I’m considering buying 8’’ version of this printer in the end of this year with J-Head hot-end (3mm), because I want to try both ABS and PLA. Question about AluhotendV4 – do you have 3mm or 1.75mm version? Is any noticeable visual difference in quality of printings between 3mm and 1.75mm filament? I think that’s a good decision! I have the 3mm version. I have not yet used 1.75mm filament, but I think there are some very compelling reasons to try it, especially with all-metal hotends and PLA. As far as I know, there is no diffrence in print quality, since the nozzle is the same size. So the same size, amount, and shape of plastic comes out, but because the filament going in is thinner, it has to be fed in more quickly. This means that any given section of filament spends less time in any part of the process that causes heat to migrate up the filament. Migrating heat is, of course, the major cause of PLA jams. I have also heard that 1.75 also works better in Bowden extruders. This also makes sense, since the thinner filament is more flexible, and has less surface area to rub against the inside of the Bowden tube. Right now, this is all educated guessing, as I have never used the stuff. Conventional wisdom holds that 3mm is easier to start with, and easier to find, and is still pretty much the standard. If this is your first printer, I’d suggest sticking with 3mm. Thank You for so detailed answer, Zennmaster! Yes, it will be my first 3D printer, I will use it to print cases for my electronic devices, which will be used in my garden (smart irrigation), and for hexapod frame, which is one of the mine future projects, and of course just for fun and education. Also, I consider producing filament by myself in the future for my own. So, when I will receive and put together Prusa i3 we may be can share our experience 😉 Firstly I plan to print all spare parts (which can be printed of course). Also, may be it will be good idea to by at once one spare hot end, all-metal likely, because of described possible melting. Zennmaster. I’m very interested to see what results you get with this print head. I ordered one. And have the same makerfarm I3 as you. Do you plan on sharing your config files? Unfortunately, due to my own clumsiness, I actually mannaged to break the Aluhotend as I was installing it. This was entirely my own fault, and has nothing to do with the design of the part. I am extremely confident in the design, and I have ordered another one and will be installing it as soon as it arrives. I’m anxious to get my results out there as well! As for sharing configuration.h files, I will share the changes and the settings necessary to run the AluhotendV4, but I will probably not be sharing my files entirely. The reason is that my configuration is not completely standard, and my files will pretty much only work on my particular printer, and I’d hate to set anyone else up for failure. ok. I know the nozzle output put is smaller. and the temperature might have to be set a little different then the magma. But other then that do you think there is any other settings that need to be changed? Not really. Like you say, the nozzle size is different, and that’s something to set in your slicing program. Temperature values will probably need to be tweaked a bit, and I would suggest seting your MAXTEMP value in Marlin to something like 245 or so, just to avoid any potential liner meltdown issues. Yeah, I’m working with my hosting company to see what’s going on with that. Thanks for mentioning it! Hey Zennmaster, have you had a chance to test out the hotend? How is it handling the stress so far? Thanks also for reminding me that I somehow missed writing up part 2! So I bought the Aluhotend hot end back when you said it was good. And I used it for a few months and then kept getting clogging issues. So I gave up for a while. Well I’m back and I want to print! but my Aluhotend still is having issues. I searched around about how to clean a hotend and found some people that use nylon 618. What do you recommend? I’m not sure if it’s the hot end that is having the issues or if it’s the hobbed bolt is just loosing it’s grip.